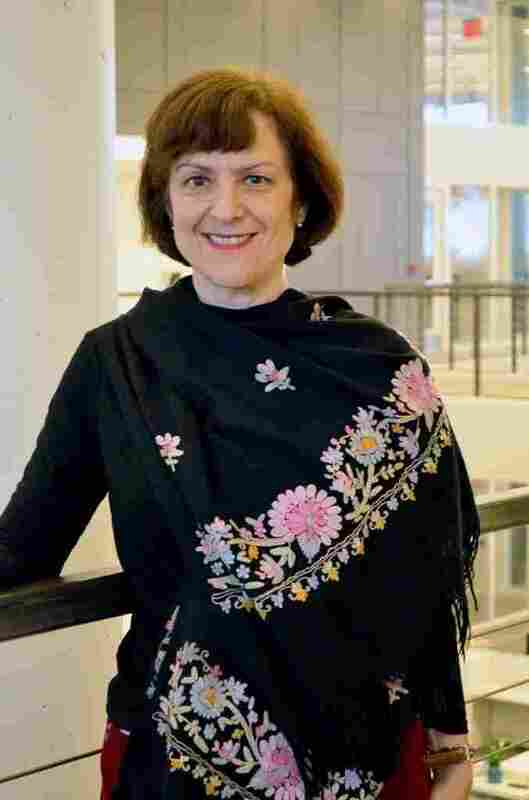 Editor Elizabeth Benedict received this embroidered, black wool scarf from her mother. It was the last gift she got from her mom before she died. Mother's Day is this Sunday. While some people are racking their brains to think of the perfect way to show their love and appreciation for Mom, a group of distinguished women recently flipped that script and wrote about the most profound gift their own moms gave to them. 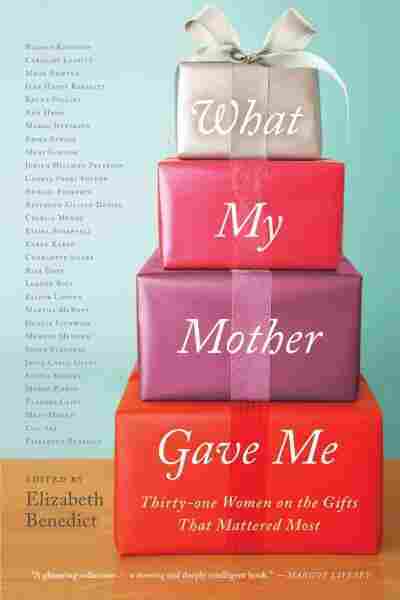 Their essays are collected in the new book What My Mother Gave Me: Thirty-One Women on the Gifts That Mattered Most. The book springs out of editor Elizabeth Benedict's personal experience. The last gift she received from her mother was a black wool scarf, embroidered at each end with yellow, pink and blue flowers. "She bought it at the assisted-living facility where she lived. And as soon as I began wearing it, people started commenting on how beautiful it was," Benedict tells Tell Me More host Michel Martin. "And after she died, I wore it all the time in the winter. And I was literally confused by how I could feel this attachment to the scarf and having felt so much distance from my mother." Benedict went on to wonder about the experiences of other women, such as activist and MacArthur "Genius" Cecilia Muñoz. "I lost my mom about five years ago, and it felt like a wonderful opportunity not just to pay tribute to her, but also to reflect on what she gave to me, what she gave to us," says Muñoz. "In my case, I come from one of those big sprawling immigrant families and my mother was very much at the center of it." Muñoz is the daughter of Bolivian immigrants. Her parents married in 1950, and they planned to stay in the United States for just one year so her father could finish his engineering education. But when they decided to return home, their families told them to wait because of a poor economy and political situation. Muñoz received a wok from her mother, whose relationships with everyone in the family largely related to food. She was a homemaker and accomplished chef. She even sold cosmetics. "It's funny because we didn't see her as a working woman at the time because this is like one of those companies where you do makeup parties, essentially. ... She was terrific at it, but she designed it so she could also be there to take me to music lessons and take my brothers to debate practice, and you know, be a traditional mom in the same way she managed to do all of that," Muñoz says. Now that the activist is juggling an intense job and kids of her own, she understands why her mother was washing the kitchen floor at 11 p.m. or doing laundry at 6 a.m. Muñoz does the same thing, she says. The book includes many other diverse voices, like television host and minister Lillian Daniel, former U.S. Poet Laureate Rita Dove, Slate's Supreme Court reporter Dahlia Lithwick, best-selling novelist Lisa See, and even NPR founding mother Susan Stamberg. Benedict says she wanted a real range of experiences so the book would feel like the actual world we live in. "I started with the idea that I wanted people to write about an object. And if I had said to all these people, 'Write me a story about your mother,' I think I wouldn't have gotten anything because people would've freaked out," Benedict says. "But I think being able to focus on one object and tell the sort of beginning and middle and end of that object and how it radiates and reverberates really allows people to get to the core of the relationship." The objects are not diamond rings, fancy cars or houses. They're modest: a photograph, quilt, cake pan, plant, bottle of nail polish, even a cracked vase. "These are not gifts that have a lot of financial value, but the value of the gifts accrues over time," Benedict says. "The value comes from the relationships themselves, and how people process the relationships, and how people move through their lives with their mothers in life and in memory." See photos of the contributors' gifts and families – and share your own photos and stories!